Thanksgiving is all about rich, comforting foods. That’s one of the things I love about the holiday. That said, sometimes it’s nice to get a fresh salad on the table or some veggies that haven’t been drenched in butter, sugar, or both! Today I have a quick and easy salad recipe for you that offers that element of freshness but still has the Thanksgiving comfort of autumnal, root vegetables. Two weeks ago I ate at Sam’s Chowder House in Half Moon Bay for the first time. I ordered the clam chowder, of course! And it was amazing. Oh. Those. Clams. Anyway, my friend Mindy and I split a beet and carrot salad, to counteract the buttery, creamy soup we were going to be eating for dinner. The salad was great! The roasted carrots and beats were delicious served cold with fresh greens, creamy feta cheese and pistachios. The salad was tossed with a savory dressing, which balanced well with the sweetness of the vegetables. The very next day Libby’s asked if I would work with them to make a recipe using their canned sliced beets and sliced carrots. I responded with a big fat YES, knowing that I wanted to recreate the beet and carrot salad I had eaten the night before. The Thanksgiving salad stars were aligning! 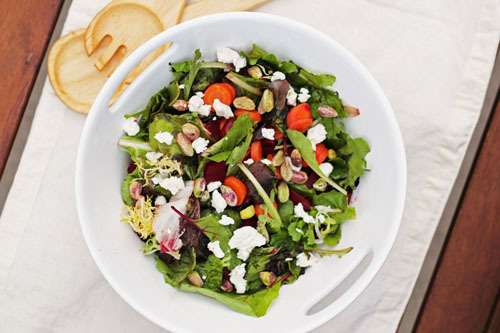 It’s a simple salad that’s full of flavor, and using Libby’s canned sliced carrots and sliced beets makes it quick and easy to throw together. Quick and easy are always welcome recipe attributes on Thanksgiving Day! Before we get to the salad, how about a giveaway? Okay? Okay! The randomly-selected winner of this giveaway will receive a KitchenAid 6-Qt. Slow Cooker along with an assortment of Libby’s fruits and vegetables, courtesy of Libby’s. For the record, this slow cooker is totally awesome. Four heat settings and all kinds of programming options? Totally jealous. Anyway, enough about me and my envy, here’s how you can enter! Simply leave a comment to enter! If you’d like to share your favorite healthy Thanksgiving recipes in your comment, we’d love to hear your ideas, although it is not mandatory. For additional entries you can “Like” Libby’s on Facebook and/or follow Libby’s on Twitter. Be sure to leave separate comments for each entry! All comments must be added to this post by Midnight PT on Tuesday, November 27. Big thanks to Libby’s for an awesome giveaway! Good luck to all! And now for the salad! Mix everything together! Add salad dressing right before serving and toss. My slow cooker just died. This would be perfect! I’d love one this big! That looks like an awesome slow cooker. My crock insert cracked and I’m in desperate need of a new one!! I like to substitute cauliflour for potatoes when doing mashed potatoes! It’s alot healthier! I could definitely use a bigger slow cooker. Would love this slow cooker! I have been looking at slow cookers, and the KitchenAid model looks awesome. I would love to win! My favorite Thanksgiving item is my mom’s butterhorn rolls. Yum. I would love this! A fresh, crunchy salad is always welcome on my Thanksgiving table. If it tastes as good as it looks, we are all in for a treat! We don’t really eat too many healthy side dishes on thanksgiving…unless you count the corn! But that’s usually saturated in butter so I’m going to say its leaning it to the unhealthy side just like the sweet potatoes covered in brown sugar and butter! My kids broke mine….i need this! In a family of 7 a crockpot is a must! Hope you have a wonderful Thanksgiving-thanks for the very nice giveaway. One of my favorite recipes is roasting carrots and fennel together and sprinkling them with parmesan cheese when they’re done. Then I toss fresh spinach in a red wine vinaigrette to which I add the roasted vegetables! I liked Libby on FB and follow them on Twitter too! Slow cooker is on my xmas wish list! Great Prize! Love Libby’s products too! I love beats! And now that I know white bread and ice can get beat stains out of clothes, I cook with them more. I would love to win a slow cooker! Thanks for the chance. I like Libby’s on Facebook. I follow Libby’s on Twitter as well. 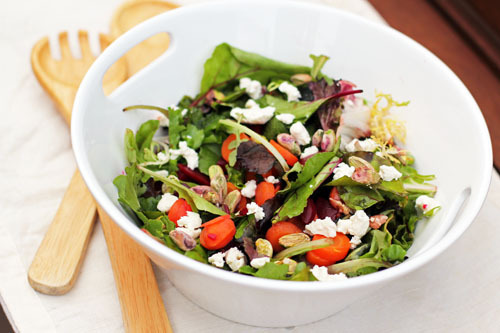 This salad sounds yummy, will add it as something healthy for our Thanksgiving meal. 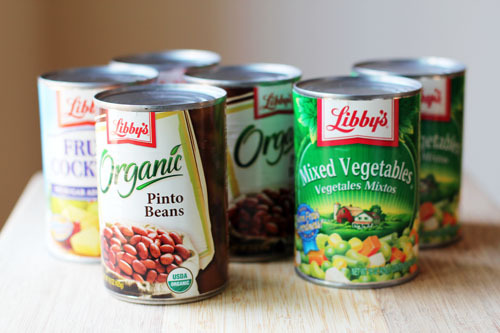 I liked Libby’s on facebook! Fantastic giveaway and a great blog too! I was slow cook in’ when crock in’ wasn’t cool! Great giveaway! Would love to win the slow cooker! Would LOVE to win this!! I pretty much cook every meal we eat in our 10 year old slow cooker. I try to incorporate lots of veggie side and salad with our Thanksgiving meal for those who want to make lighter choices. Thanks so much for the opportunity to enter. I like Libby’s on Facebook page. Sweet potatoes in the crock pot! Yummy! We don’t really “do” healthy on Thanksgiving. Although we do make everything from scratch so there are no cans, box mixes or preservatives. Kitchen Aid and Libby’s – what a winning combination! I use my crock pot often. It is the one I received as a wedding gift twelve years ago. It still works well; however, the lid no longe fits tightly. this salad sounds awesome. my favorite healthy thanksgiving dish is a mixed veggie dish my mom makes. so good 🙂 thanks! Thanks for the giveaway! Slow cookers rock! I happily accept this fabulous slow cooker! The Thanksgiving meal is when you should through caution to the wind and not worry about healthy. Love beets! But I’m going to save the “healthier” recipes for after Thanksgiving! haha. My slow cooker is having a rough time so this would be a wonderful win. Thanks and have a Blessed Thanksgiving!! I liked Libbys on Facebook! OOH I would love to win a new slow cooker. My crock broke a few months ago and still needs to be replaced. The salad looks interesting, but I’d pickle the beets first, since they aren’t roasted. In fact, I pickled a can of Libby’s just last week. I have always tried to keep Thanksgiving fairly healthy. Use a special cup with spout to keep the fat out of the broth for the gravy. Also, I make mashed sweet potatoes using orange juice and just a small amount of brown sugar, then season with cinnamon and nutmeg. Another well received dish is marinated green beans. Just cook frozen beans and then marinate them in fat free italian dressing and serve them cold. Really good corn steamed in the microwave and served plain is also very popular. We frequently have my father-in-law’s home grown and frozen corn, or I splurge and get the more expensive frozen baby corn or other vegetables. They don’t need a lot of rich additions to taste great. I love the mashed potatoes! I would love to have a big slow cooker! I love corn with browned butter and dill. Roasted broccoli is quite tasty. I brought this to Thanksgiving dinner last year when i was assigned to bring a hot veggie dish other than green bean casserole. Throw on a little parmesan and I could eat a whole pan! This looks amazing! I would love to win this! I’d love a new slow cooker…mine is on its last leg. I love sweet potatoes on Thanksgiving. That salad looks great! My vegetarian sister would love it! I am always looking looking for recipea that she and the family will eat. I would LOVE a new slow cooker! I finally found a great recipe book (“Holly Clegg’s trim&TERRIFIC KITCHEN 101: Secrets to Cooking Confidence” by Holly Clegg), that has an amazing Crock Pot chapter as well as crockpot symbol to designate crockpot recipes throughout the book, and my crockpot has started to crack :(. My crock post has one handle and something inside it rattles??!! Would love to win! I’d so love to spend my days finding recipes to put in this slow cooker! Food Network has a recipe for bell pepper slaw…made it this year and everyone loved it! I’m following Libby’s Table on Twitter! ‘Tis the season for using the slow cooker! I don’t worry too much about making a particularly healthy holiday meal. I do try to use organic products and make everything from scratch. I include traditional dishes from my mom and my mil. I usually make my mashed potatoes with a mix of potatoes and cauliflower. Like you, I make a salad with baby greens and seasonal, colorful add-ins. Before and after the feast, we are active. We might run in a local 5K in the morning and end the day with a brisk walk or a trip to the bowling alley. What a great give-away! I’d love to won the Kitchen Aid crock pot. Thanks for the opportunity. i love beets in a salad! awesome giveaway! I love corn and carrots together(orange and yellow) little bit of butter and pepper. So yummy! That salad looks so tasty! !